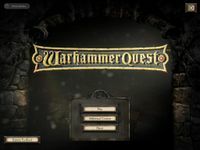 Warhammer Quest is the video game adaptation of the 1995 Games Workshop board game of the same name. In it you lead a band of four heroes through randomly generated dungeons in order to defeat monsters and collect loot. Characters can use the loot they acquire to purchase training to improve their skills and can gradually take on tougher and tougher opponents.